Another awesome anime from Kyoto Animation! Tamako Market is a 12 episodes TV anime aired in January 10, 2013 to March 28, 2013. The story is quite lightweight just like most anime I usually watch. This is one a few anime that deserves the title of 「アニメの力」 or “The Power of Anime” because this awesome anime wasn’t adapted from other media. Acchi Kocchi is slice of life anime. It’s very lightweight and entertaining. You don’t have to think a lot when watching this anime. Just sit and enjoy the show. This anime has 13 episodes in total. Episode 1 to 12 were aired from April 16, 2012 to June 29, 2012. Episode 13 was included in the last volume of BD/DVD. 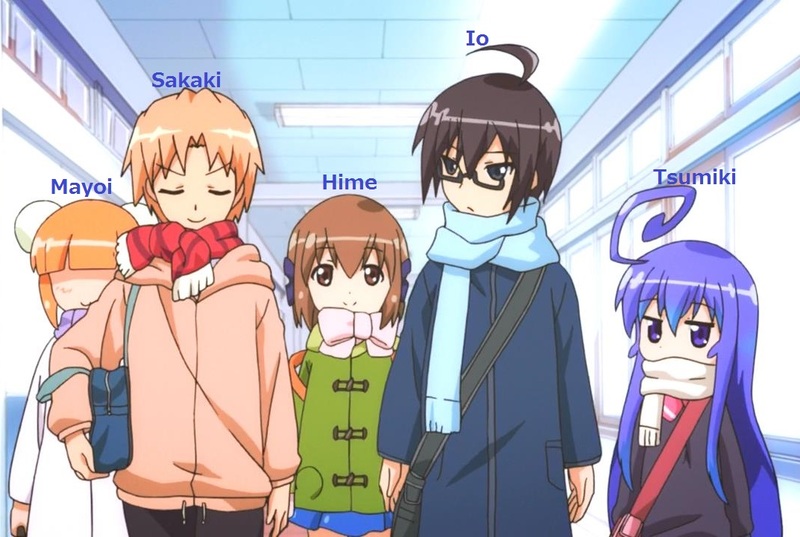 The anime focuses on 5 main characters. All of them are high school students on Nekoge high school. Otonashi Io, a pure hearted and charming boy but also very dense. Miniwa Tsumiki, a tsundere girl who have a crush with Io. Often shown with cat ears, especially when reacting to Io. Katase Mayoi, a girl that seems to be hyperactive and always wear a lab coat. Haruno Hime, a cute girl who seems to be very innocent. Often has a nosebleed when Io says a romantic words. Inui Sakaki, a somehow hyperactive boy in the gang that often becomes the victim of others. Besides them, there are some supporting characters as well that appear in several episodes. And what makes this anime very comfortable to watch is there are no annoying characters in this show! That’s great (at least for me)! I am looking for something entertaining after all, not something annoying. The story seems to be focusing in school life and friendship. Friendship, eh… It’s one of a few theme that I really like. But to be honest, I feel kinda bored with high school stuffs. There are too many anime with high school theme and there is no end to them. Back to Acchi Kocchi, this anime also comes with a lot of pranks and sometimes hyperbolic jokes that almost make no senses, especially from Mayoi’s. There are so many funny stuffs in this anime and most of them come from Tsumiki’s tsundere image, Hime’s reaction, and Sakaki’s or Mayoi’s pranks. In the end of the last episodes, I wish they would make something more, especially to answer Tsumiki and Io’s relationship. Somehow I feel sorry with Tsumiki because she keep holding her feeling towards Io all the time. The artwork itself is kinda cute. The image quality is decent but it’s not bad by all means. Just lack of stand out feature, especially compared to A Channel which a background image that rivals and even bests most Visual Novels. The BGMs are nice and gives more feeling the atmosphere. Still not the best in class however, that’s also belong to A Channel. The Opening and Ending theme song is decent. While it isn’t bad, it is also not something that I would really enjoy when just listening to music. To be honest, Acchi Kocchi lacks of stand out visuals or audios, but I still categorized it as very good because the story itself is very enjoyable. How about the seiyuu? Seiyuu plays a very important role in the show because their voice will determine the characters’ image. I got some familiar name of female seiyuu in this anime. Tsumiki was voice by Ookubo Rumi. That’s Chinatsu’s seiyuu in Yuru Yuri and I really hate Chinatsu because she’s the most annoying character in Yuru Yuri. Ookubo’s voice gives a lot of contribution for that. But this time, she gives a lot of contribution to makes Tsumiki’s tsundere image looks very cute. Mayoi was voice by Nabatame Hitomi. I thought Mayoi’s seiyuu was Takagaki Ayahi but I was wrong. I wouldn’t doubt Naba-nee’s acting performance due her experience as seiyuu. She isn’t a new seiyuu and proofed to be capable in handling many kind of roles. Hime was voiced by Fukuhara Kaori and this is the most attractive voice for me. Kaorin’s voice is really cute. She was using the same tone as when she voiced Hiiragi Tsukasa in Lucky Star and Run in A Channel. This is something that I really like. Io was voice by Okamoto Nobuhiko while Sakaki was voice by Asanuma Shintaro. Unfortunately for me, I don’t know much about male seiyuu, so I don’t have any clue about them. You’ll also find some popular name in supporting character like Konno Hiromi who voiced Kana, a classmate of Io and Tsumiki and Iwao Junko who voiced Kikue-sensei, their clumsy teacher. Compared to other TV anime in 2012, I’d place Acchi Kocchi on 3rd place on my lists right after Yuru Yuri♪♪ in 2nd place. The best TV anime in 2012 in my lists belongs to Natsuiro Kiseki which scores much higher than this anime although it’s not a comedy. But comparing Acchi Kocchi to Natsuiro Kiseki is like comparing something very good to something masterpiece. If I added OVA as well, A Channel +Smile ranked in 2nd place directly below Natsuiro Kiseki. That means Yuru Yuri♪♪ is in the 3rd and Acchi Kocchi is in the 4th place. 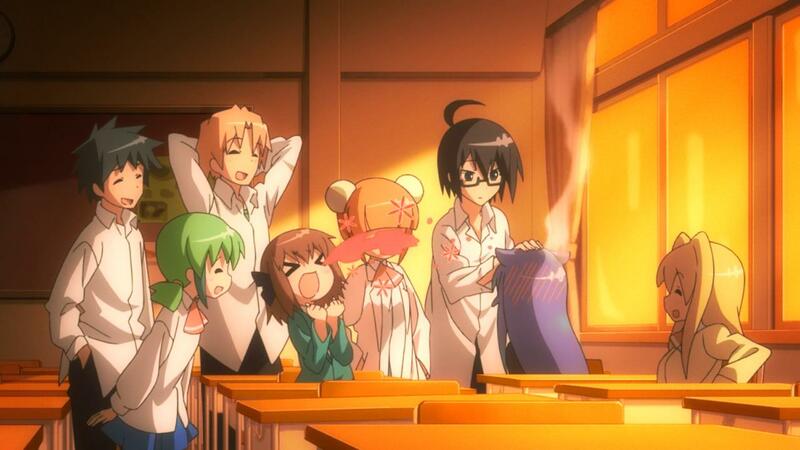 While Acchi Kocchi is a very good anime, it doesn’t have stand out any features that makes it the best in something. But of course, that isn’t something easy to achieve consider there are tons of anime title coming out every years. 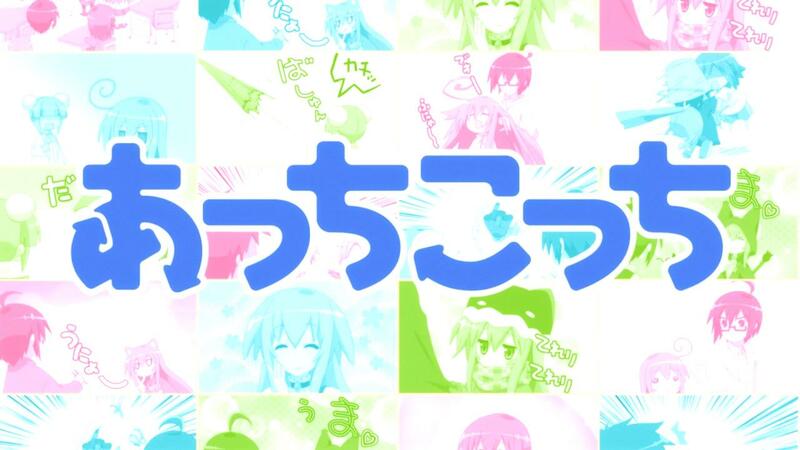 The bottom line is, Acchi Kocchi is a very enjoyable show packed with interesting humours that will make you smile or even laugh. I couldn’t find anything that I would consider it as a weakness in this anime. Just watch, enjoy, and don’t think too much about it.